To advance the Misesian tradition of thought through the defense of the market economy, private property, sound money, and peaceful international relations, while opposing government intervention as economically and socially destructive. The Mises Institute, short name for Ludwig von Mises Institute for Austrian Economics, is a tax-exempt educative organization located in Auburn, Alabama, United States. It is named after Austrian School economist Ludwig von Mises (1881–1973) because it promotes teaching and research in the Austrian School of economics and misesian views on social and political philosophy. The Mises Institute was founded in 1982 by Lew Rockwell, Burton Blumert, and Murray Rothbard, following a split between the Cato Institute and Rothbard, who had been one of the founders of the Cato Institute. Additional backing for the founding of the Institute came from Mises's wife, Margit von Mises, Henry Hazlitt, Lawrence Fertig, and Nobel Economics Laureate Friedrich Hayek. Through its publications, the Institute promotes libertarian, paleolibertarian and anarcho-capitalist political theories and a form of heterodox economics known as praxeology ("the logic of action"). The Ludwig von Mises Institute was established in 1982 in the wake of a dispute which occurred in the early 1980s between Murray Rothbard and the Cato Institute, another libertarian organization co-founded by Rothbard. Llewellyn Rockwell has stated that the Mises Institute met strong opposition from parties affiliated with the Koch family, Rothbard's former backers at Cato. Rothbard was the Mises Institute's vice president and head of academic programs until his death in 1995. The Institute states that its founding ambition is to be "the research and educational center of classical liberalism, libertarian political theory, and the Austrian School of economics". It has reprinted works by Mises, Rothbard, Hayek, and others. It presents the annual "Austrian Economics Research Conference" (AERC) and "Mises University", at which Austrian School thinkers meet, and Institute personnel teach and advise students, respectively. The Institute reports that its library holds nearly 35,000 volumes, including Rothbard's personal library. Early after its founding, the Mises Institute was located at the business department offices of Auburn University, and relocated nearby to its current site in 1998. According to a story in the Wall Street Journal, the Institute chose its Auburn location for low cost of living and "good ol' Southern hospitality". The article goes on "to make an additional point", that "Southerners have always been distrustful of government," making the South a natural home for the organization's libertarian outlook. The institute has a staff of 16 Senior Fellows and about 70 adjunct scholars from the United States and other countries. In a 2006 article published on the Wall Street Journal's website, Kyle Wingfield credited the Institute for helping make the "Heart of Dixie a wellspring of sensible economic thinking." Wingfield pointed to the Institute's publication and promotion of the work of Mises and other Austrian economists, who he characterizes as advocating "limited government, lower taxes, stronger private property rights and less business regulation." A 2000 Southern Poverty Law Center "Intelligence Report" categorized the Institute as Neo-Confederate, "devoted to a radical libertarian view of government and economics." The Mises Institute has been criticized by some libertarians for the incorporation of paleolibertarian and right-wing cultural views, including the positions taken by some of its leading figures on topics such as race, immigration, and the presidential campaign of Donald Trump. Often these criticisms affirm that there are aspects of the paleolibertarian ideology that supposedly are at odds with the views of the historical Ludwig von Mises. In an article written on Institute Chairman Lew Rockwell's website, Jacob Huebert observes that socially liberal libertarians have often accused the Mises Institute of racism. He calls the charges erroneous and argues that they might stem from the support of some Institute scholars for immigration restrictions, its support of Confederate secession, or its uncompromising stand on libertarian issues and property rights. In 2003, Chip Berlet of the Southern Poverty Law Center (SPLC) described the Mises Institute as "a major center promoting libertarian political theory and the Austrian School of free market economics", also noting Rothbard's opposition to child labor laws and the anti-immigrant views of other Institute scholars. Heidi Beirich, also with the SPLC, describes the Institute as "a hard-right libertarian foundation". The Mises Institute makes available a large number of books, journal articles, and other writings online, and archives various writings on its website. Its Quarterly Journal of Austrian Economics discusses Austrian economics. It published the Journal of Libertarian Studies from 1977 to 2008. The Mises Review has been published since 1995, the quarterly review of literature in the social sciences being currently edited by David Gordon. The Institute presents the annual Schlarbaum Prize for "lifetime defense of liberty", a $10,000 prize given to a public intellectual or scholar. Laureates have included U.S. Congressman Ron Paul and economists Walter Block and Hans-Hermann Hoppe. Other honors include the Murray Rothbard Medal (also won by Block, Hoppe and Paul, as well as by economic historian Gary North), the Ludwig von Mises Entrepreneurship Award, the O.P. Alford III Prize, the Douglas E. French Prize, the Elgin Groseclose Award for money writing, and the Fertig Prize. Joseph T. Salerno – Academic vice president of the Mises Institute, professor of economics at Pace University, and editor of the Quarterly Journal of Austrian Economics. ^ "Mises Academy:What Is The Mises Institute; What We Do". June 18, 2014. ^ "Ludwig von Mises Institute for Austrian Economics Inc" (PDF). Foundation Center. Retrieved October 18, 2018. ^ Sam Tanenhaus and Jim Rutenberg (January 25, 2014). "Rand Paul's Mixed Inheritance". New York Times. Retrieved February 20, 2014. ^ Its website states that it exists to promote "teaching and research in the Austrian school of economics, and individual freedom, honest history, and international peace, in the tradition of Ludwig von Mises and Murray N. Rothbard." "What is the Mises Institute?". Mises Institute. Mises Institute. June 18, 2014. Retrieved August 30, 2016. ^ Peterson, William H. (2009). Mises in America. Auburn, AL: Ludwig von Mises Institute. pp. 18–19. ISBN 978-1933550428. ^ Stromberg, Joseph (August 2, 2000). "Raimondo on Rothbard and Rothbard on Everything". Retrieved January 10, 2010. ^ Gordon, David (April 22, 2008). "The Kochtopus vs. Murray N. Rothbard". LewRockwell.com. Archived from the original on December 20, 2013. Retrieved November 17, 2011. 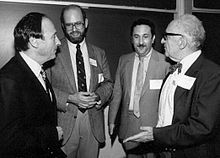 ^ In the 1980s, Lew Rockwell and Murray Rothbard developed a paleolibertarian strategy, a culturally conservative conception of libertarianism to counter left- or liberal-libertarianism. In an article about the Ron Paul Newsletter controversy, Austrian economist Steven Horwitz discussed the strategy and said the Institute at the time had "numerous connections with all kinds of unsavory folks: racists, anti-Semites, Holocaust deniers". See: Dalmia, Shikha (December 25, 2011). "The Right Way for Ron Paul to Respond to Newsletter Controversy." Reason, citing Horowitz, Steve (December 23, 2011). "How Did We Get Here? Or, Why Do 20 Year Old Newsletters Matter So Damn Much?". Bleeding Heart Libertarians. ^ "Ward & Massey Libraries". Mises.org. Retrieved November 13, 2011. ^ "The Mises Campus". Mises.org. Retrieved November 13, 2011. ^ "Faculty Members". Mises.org. Retrieved November 13, 2011. ^ a b Christopher Mayer (February 16, 2000). "Democracy is Coercive". ^ "Does Democracy Threaten the Free Market? – N. Joseph Potts – Mises Institute". April 10, 2003. ^ "Chapter 5 – Binary Intervention: Government Expenditures (continued)". ^ "Does Democracy Promote Peace? - James Ostrowski - Mises Daily". Archived from the original on August 21, 2009. ^ Peterson, William H. (2009). Mises in America. Auburn, AL: Ludwig von Mises Institute. pp. 81–82. ISBN 978-1933550428. ^ "The Neo-Confederates". Intelligence Report. Southern Poverty Law Center. Summer 2000. ^ Beirich, Heidi (February 9, 2011). "Ron Paul Invites Neo-Confederate Witness to Testify in Congress". Hatewatch. Southern Poverty Law Center. Retrieved June 17, 2014. ^ "The Quarterly Journal of Austrian Economics". November 23, 2014. ^ "Journal of Libertarian Studies". ^ Rockwell, Llewellyn H., ed. (August 18, 2014). Murray Rothbard, In Memoriam (PDF). Auburn, AL: von Mises Institute. pp. 64, 127. Wikimedia Commons has media related to Mises Institute.